I remember it being the start of the school year; September 16th, 2016. “Why and who decided that our children have to leave every year, to a building filled with other children to be taught what they could essentially learn from home? Being exposed to groups of people they hardly know, who will expose them to many things that at their age they should not know. To take my children’s heart and trust it to a total stranger and believe they will guide them to Christ like me. Who decided that I had to take the children God trusted me with and hand them over for 6 hours a day to a place that doesn’t allow Gods name to be spoken. When did this become the norm and why had I just now questioned this? My husband would agree and ask me what I think we should do. That I was right and I would have no choice but to bring it to the Lord; and he’d say “I agree”. Now before I loose you all, I want to say that I don’t think Public Schools are the devil, or that you’re a bad, bad, mom for allowing your kiddos to attend public schools but unfortunately that’s where the enemy roams with freedom and he reigns.. or have you missed it? Trust me, its nothing new either. So please don’t take it personal but rather as a blog post of my personal experience, as many of you have asked me to write about our choice. In no moment will I want to tell you, you are wrong or that I’m better but simply sharing our choice. I’ve worked as a volunteer in the public schools since my oldest daughter started preschool and from that time I’ve gotten my license as a PeraEducator; I’ve seen what many don’t see because I have worked inside the school. So while many moms, including myself, would drop off their children and take on their day; our children enter through a door and waiting there at the door is great influence waiting to devour our children that contradict everything we teach them. I can’t always shelter my children but goodness can I do it for a while; especially if I’m able to, why not? Aren’t I called to protect them? Alright now listen, I grew up in the public schools, in LA, San Jose and here in the Northwest and I can tell you that no matter what school I went to the enemy shows his face and especially for our children, the children of Christians. It’s not that we’re so super special, but it’s because of who we, as parent worship and pray to that the enemy wants to discredit our believes and our love for God through stealing our children and deceiving them. Have you noticed that? So back to the story, I remember struggling through this thought for months and by experience I know that when for me, when I have something like this on my mind for that long; it means The Holy Spirit is trying to speak to me. He’s trying to get me to bow my knees and ask God this question. Naturally I knew this and like Jonah, I wanted to board a ship to: “I can’t hear you island”. <<<< Cheesy. Around December I remember meeting up with a few new gals I had met on a mothers group and when we all sat down to chat they all shared they were home school moms. My first thought was judgment. No no-no not that I felt judged, but I was judging them. Pansies, they are sheltering their kids from the world. These moms are a bunch of babies, how else are our children going to practice their faith or become strong without temptation? So what, are these control freak moms going to attend their child’s interview as an adult too? Why are they so scared of the world? 7. I WOULD NEVER HOMESCHOOL, I’m not patient enough. I just have you know that, yes, these are my sinful thoughts. That, no, I actually don’t have angel wings that carry me from my bedroom to the restroom in the mornings. So having these thoughts I was so confused as to why, having “my” reasons I still couldn’t shake that initial thought. One of the moms said to me, “you would be a great homeschool mom”. I just looked at her and said, ” we will see, I’m not in a rush”. Um.. what does that even mean because I’ll tell you that I was in a rush just last week as I pulled them out of the school for the rest of the year and next untill we know God calls us to change it. Around January my husband was promoted to a new position within his company and his days off were now Thursday and Friday. He would only get to see his children a few hours a day before we rushed them to bed for a new day of school. He came to me one night and said, ” I don’t get to see my own children and I’ve been thinking we should homeschool. There are many benefits to it but a huge one for me would be that on my days off I can be with my children. Also I know you can do it, we, can do this. I feel like its our job as parents to raise them ourselves and not a school”. Nooooooo, I thought in my mind as I had purposely hidden my conviction of this for months. He went on explaining to me why we should homeschool and I had to agree that, yes, he was right. So that night we prayed to God and brought it to him, my husband convinced 100% that this was the right decision thanked God for the opportunity; while I stood there thinking, “um he hasn’t answered yet, why are you thanking him in advanced” haha seriously I did that. More time went by and on the month of February, this year 2017, my husband was diagnosed with MS (multiple sclerosis) and that brought up the topic of homeschool once more. He said, “more than ever do I want to be with my kids”. So I prayed still… yes I’m that stubborn and blind when it comes to seeing what is right and not doing it. That same month my oldest daughter seemed, off , I just knew something was wrong so I pulled out her favorite book and read to her and towards the end as we snuggled I asked her what was going on. She shared with me that she hadn’t had a recess in almost a week because she messed up on her test and the teacher was making her re-do it over and over again, breathing down her ear. My daughter gets very nervous when timed and this teacher was doing just that. The teacher and I talked about the issue and she told me that she was behind in math, the only thing was that when I helped her here at home she did great. Now at school she froze and told me that the teacher was making it confusing and she felt like she was stupid, when we both knew she was not. Hello Common Core. Evelyn was thriving at home, teaching her my way and not the way state standards call the teacher to do it. On that same week my youngest came home and asked me what, ” making out” was because a boy in her class wanted to do that with her, mind you she is in first grade. I decided to look up what it was I needed to be able to homeschool here in my state and I found out I needed to be certified and so I took that as my made up reason that God didn’t want me to do it. Am I the only one that does that? So I was emailed a list of women to call to attend this course to be certified and I left it there until one night I could not sleep and it kept eating at me that I didn’t even try. So the next morning I decided to just call in hopes that the courses would have passed and use that as my excuse. So I called the first five (5) numbers on the list, there were only six (6), and no one answered at all. I had one more number to call and when I called the last number a lady answered and we started chatting about homeschool and what exactly I needed and the days of the seminar and how much it was. Now get this, I said to this woman, “we were hoping to find a Christian seminar”, only two from the list were Christian based I found out later. She says in a high pitch excited voice “I’m your gal, we are all Christian based and one of the few in your area and we are having an early sign up special and these are the days…”. I usually don’t use emojis, but, 😐 . As if God was looking down and thinking, “what other excuses you have now?” Haha. So I told my husband about it and he smiled big and told me that I knew what to do. This decision has to be made between both you; your spouse, and God not you and your mom or you and that one lady from the grocery store. So friends the people I once judged, were the people I reached out to for help. I’m like the modern Paul… except not as holy or as amazing. The same women I once spoke harshly about to my family, the people I laughed at for being pansies were now cheering me with grace to do this. The women I looked down on for sheltering their children from the real world were now the same women who shared with me their fears and victories of their homeschool convictions. I had to come to Jesus and apologize for my condemning attitude toward things I was ignorant to. Toward the women that now take me in and help me, to his Holy Spirits convictions. For disregarding my husbands headship for so long in this. For us, homeschooling is a mix of things and not fear that the world is bad because it has been and it will continue to be until Jesus returns. “I don’t recommend that you homeschool out of fear of the world, but to homeschool out of love for your children and their salvation until the day they are ready to face the world we live in. Fear is not the right reason; teaching them day and night is a gift and homeschooling allows us to do that. We are called to be fearless in the name of Jesus and instead many parents homeschool out of fear and coward towards the world and their children see it and most the times those kids will be the same and grow up not knowing the beauty of using their gifts to reach those in the world. Never school out of fear, but out of love”. For us homeschool will allow room to teach Jesus for more than a few hours a day, to teach our children to be rotted in Christ to face the world that we are called to reach out to. 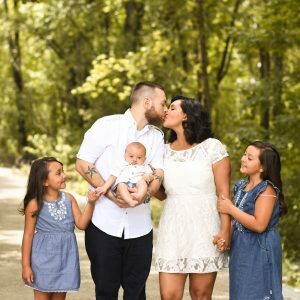 It will allow my husband to be with his children; it will allow my husband to not miss years of his children as his MS steals his energy, ( we believe in Jesus name that he will be healed). It will allow me to practice my patience. It will bless me in being the main source of Jesus they get to see. In being together and face their sinful hearts in a safe place to be corrected to become bigger in Christ. To raise my children myself, to raise my children to be together 24/7 even if they argue and use that as an opportunity to learn instead of separating them. To confront sinful behavior and to see them excel as they grow and learn more and more each day. It allows us to be a family without rush and freedom to grow spiritually, mentally, physically and emotionally. Will my children ever go to public school? Maybe in the future, maybe not. Whatever it is God calls us to do is what we want to do. Choosing to homeschool is a personal decision between you, your spouse and God. So friends I wish I had this super Christian reason why, but these are the reasons and they were enough for me to go and do this for the glory of God. I could have given you all scripture that many people use to ridicule others Christian moms on allowing their children to attend public school, but the truth is… I wont, I can’t and it’s not ok. I can NOT take scripture and twist it to benefit what I think it says out of fear. Homeschooling, much like vaccines, the amount of children you have, birth control, coloring your hair and putting make up on is always going to be things that you should pray about. Based on what God calls you to do for your family, pray, pray and then pray more. If you have been feeling God calling you to this, don’t ignore it; trust that his plans are better than yours. Obey him and let him guide you, let go of fear and find peace in knowing that as Christian moms Gods grace fills the crevices we miss. 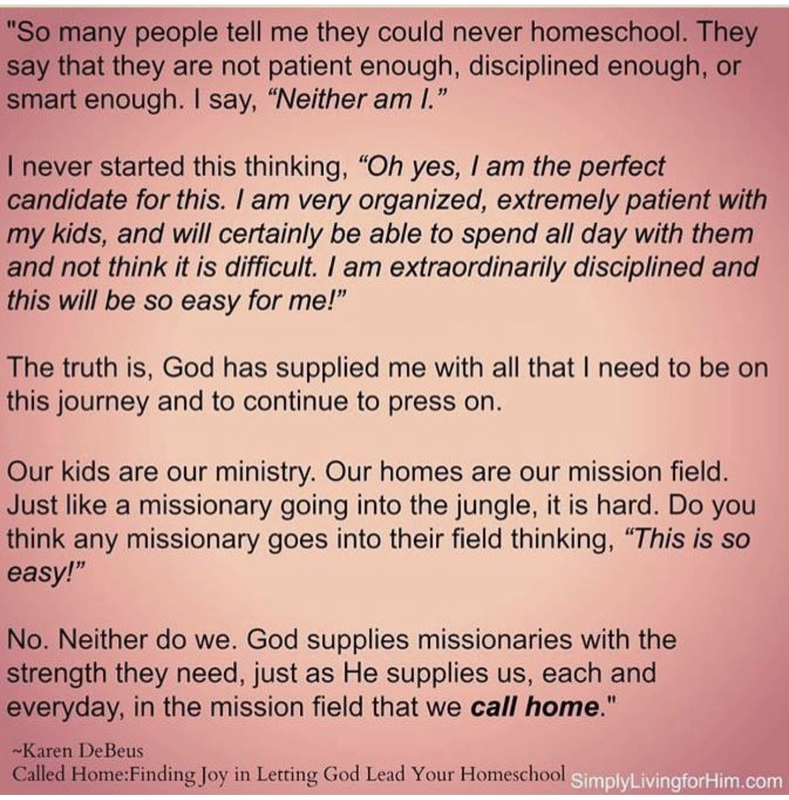 If you feel God is leading you to homeschooling, I would beg you to do it. It wont be easy as I’m always told but with God, friends everything is possible; even something like this. We faith and a little confidence, you will do just fine. The first year is the hardest and you will sometimes wonder if you’re doing it right. As long as the children are learning, you are doing your job. Pre Planned curriculums work great especially if you are not as strong in a certain subject. There are many support groups and resources. Best of luck. I am thinking to homeschool my kids too but I am still very confused about how to do it. I am not living in the states anymore so I don’t know if I should follow any state requirements. I also have a friend who has their kids enrolled in an American school living here in Cairo but they are thought online. Do you know anything about that too? Hello there, you know I am not sure how that would go about. I wish I was more educated to give you advise, maybe asking your friend for advise? As somone who is majoring in Elementary Education, I take no offense to this. I actually completely agree. I’m only 20 and in my second year of univeristy, but I dream of the day of being able to teach in my classroom and to guide my kiddos in the right direction, but I also dream of the day I will be a mother. When I do become a mother, I want to homeschool, as well. Thank you for sharing. That’s so awesome, there are so little women who are doing what you are planning to do as a teacher! Good for you, I pray the very best for you and you get closer to graduating!! Yes! Totally agree! I plan to start my university in January! I pray we both stay in the right path through this journey! @Matiana Yes! Totally agree! I plan to start my university in January! I pray we both stay on the right path through this journey! Thanks for the response my friend.I will definitely try to learn more about it!God bless you in everything you do!Your family is lovely! 1.Are you sure you know the material? I mean,in schools there are people who have studied and are specialized in certain subjects,like Mathematics,Science,Chemistry etc.Do you have the knowledge and can you teach your girls all these efficiently? 2.Will they gain the knowledge needed to attend university and study like everybody else or will the lack of basic knowledge vital to higher education? 3.Will they be as social as all the other children?Will they be able to deal with all the difficulties?School is definitely a place where children socialize,have fun,learn things from each other.Yes,sometimes it is hard,sometimes it will be really hard.BUT Schools are basically a miniature of society,especially public schools.This is what they will face later on.Your little one asked you about “making out”.It is only natural for children after the age of 5 to be curious about sexuality in general.Trying to hide general facts like these from our children and making them believe that they dont exist will make them fear the outside world.Its like they are living inside a bubble. 4.Will you be able to follow a certain programm or will you be tired and quit? 5.What if your children dont listen to you?What if they want to do something else rather than studying?What if they dont take it seriously and in the end learn nothing essential but only have fun? 5.Did you consider that you will be stuck more hours at home?What about free time?What happens if you have many children rush all day?What if you are ill? 6.And the last one,which is something i hesitated to mention,but what if you have no external help especially from your husband?What if he betrayes you and leaves you alone dealing with many kids and rushing from one thing to another.Or if you are so focused and stuck at home that he will be not present anymore searching for other things rather than his family? Again no offence.My niece is considering homeschooling so i just want to learn. God bless you in everything you do! I had those exact questions you just gave me when I first heard about mothers taking their children out of normal school and in to their home. I don’t think I can answer all of your questions as I am new to it all but I’ve met some amazing mothers who’s children are engineers, teachers, one young gal works for NASA. There are so many resources to help out when you are “stuck” my mentor is actually a college professor and she helps in great ways to teach us parents. So no homeschool children are just as smart (given the mother looks for their benefit) in not worried at all. As far as socializing there are great ways to do that still as homeschool children are able to join all the regular sports in their district. There are co op groups everywhere. That is one of the biggest misconceptions. Now in days we have millions of ways to get help to teach our children. As a matter of fact there is a homeschool center where they help you plan out college, they help you learn what you need and also other mothers who were former public school teachers offer to teach at these groups. I know a few former teachers who themselves pulled their kids out and make groups. It would honestly benefit you to read books on homeschool and to educate yourself like I had to, to understand the beauty of it all. If I’m ill we just won’t don’t that day, homeschool allows you to teach your child at their pace and their style of learning. It allows you to have the freedom you don’t get with other schools. It allows you to be creative where as PS are taking electives out. As far as making out deal, just because it’s normal doesn’t mean I agree with it at its age. Like I said in my post, I’m not homeschooling out of fear of the world. We have our personal reasons and I know that I’m fully able to do it. I complete understand what you are asking because I had those same questions but the more you educate yourself, the more you will undertake and those questions will be answered😊. If my children want to do something else other than study, we take a break not quit. Learning is fun and it should be but we are led to believe that the way schools do it is the only way. That’s incorrect. There are so many resources, again, that can answer your questions and I had to attend seminars and get licensed to do this and they teach you a lot. They answer all these questions. It’s super amazing! Oh I didn’t see the rest of your questions here. For question 6, you know as of now I have my husbands support and help. If he ever chooses to do the things you mentioned it would be on his shoulders, his sin to bring to the Lord. I trust that God will fill the crevices with grace even those my husband lacks to support me in. Men could betray but God never will and I rest in that promise friend.